Do you know what often drives me crazy? Well there’s quite a few things actually but today I’m talking about the little things. Apparently I’m not alone. Elephant seals come to selected beaches to have their young and mate. By my limited observation, the rest of the beach time seems to involve a lot of sleeping and hanging out in the sun. That’s all fine and well except … for the annoying gulls. It’s clear no one invited these gulls to the party and no one wants them around. I saw seals jawing at them and chasing them away but there’s a problem. Despite a ridiculous size advantage and a nasty attitude, there was nothing they could do about them. The gulls were way too fast for seals to catch and just smart enough to stay out of range. So they would let the seals rage on while they would smugly sit and watch with bemusement. When the episode ended, the gulls were still right in the seals’ face. What a pain! I had to side with the elephant seals in this case. 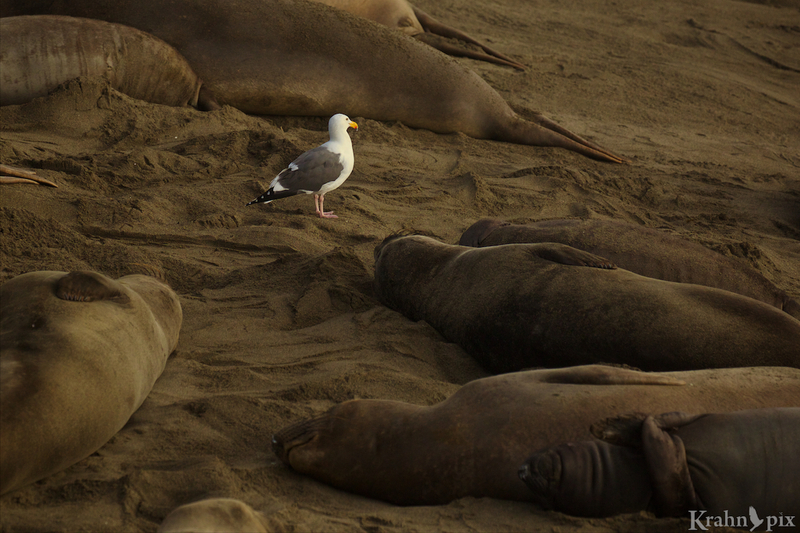 Maybe it was because every time I tried to isolate an elephant seal in a sea of bodies, another gull would pop into the picture. Go ahead and roar all you want. I’m not moving! That first picture is fantastic – it took me a second to see that there were large mammals in that picture too, not only a gull and a lot of sand… That illusion works especially well in the preview picture. Love it. Glad you enjoyed it. When I first saw that scene I was surprised at the amazing contrast between the creatures and was happy to capture it that way. It was hard to imagine a greater difference. I understand your peeve, but I must say I’d rather look at sea gulls than elephant seals – they’re much prettier! I am pretty sure those elephant seals would rather not see gulls. I’m pretty sure you are right! The gulls have the advantage of wings, all the better to photobomb the seals with! 🙂 The seals blend in well with the beach. The gull in the first one helped me find them. It turns out I can get photobombed with all kinds of creatures and inanimate objects. At least this gull made for an interesting interaction. I think, Lyle, that there is a life lesson in there for all of us–we all have petty annoyances that destroy the perfect moments of our lives. Like your seal, we can rage against those annoyances, and we all do, but eventually we probably should accept the reality that the annoyances help to shape our lives and add humor and color. I love that last image! I’m glad you enjoyed that last image. It has really grown on me. I like the contrast in the top photo. It wouldn’t have been the same without the gull! Just when I think there’s no use for a gull, it makes the photo. Go figure. They must be like a mosquito in the dark for the seals – it is annoying but there isn’t much you can do. Sorry that last one messed up your photo. Mosquitoes in the dark is a great comparison. Now if only I could get in one good slap … It’s funny but I have actually grown to quite the like that photo. The juxtaposition of the two creatures is quite amusing. And I do have other elephant seal photos without the gulls. Thankfully. Awesome post and thoughts, as usual Lyle! Thanks. I had a little fun with the gulls on this one. The interaction between the animals is fascinating. Just looking at the scars on those seals, its a hard life! Yes they were all scarred like that! What a crazy life. Maybe it gives them character. Photobombed indeed. It’s certainly not the first or last time and it doesn’t always happen with moving objects! I definitely pass your age test. I still have cassette tapes! Fantastico, veramente belle le foto e anche il resoconto di quello che è capitato.